Strawberries may be more popular (although we blueberry lovers are mystified by that fact), but blueberries are the healthiest fruit you can eat. In fact, blueberries rank number one in antioxidants compared to 40 other fruits and vegetables. But we didn't need USDA researchers to persuade us to eat these delicious berries. Even better we don't have to hull, pit, peel or core these fruits to enjoy them. Native to North America, the blueberry was held in great esteem by Indian tribes who wove an entire folklore about them. And those early Puritan Thanksgivings were made a lot tastier and healthier after the Wampanoag Indians taught the colonists how to gather, dry and store blueberries. 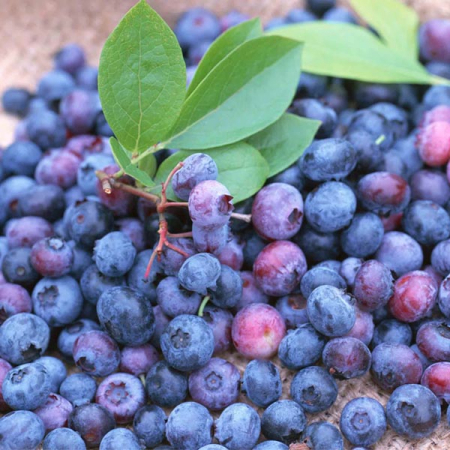 The U.S. produces 90% of the world's blueberries with a harvest season ranging from April to October. Alas, not long enough for those of us who can never get enough of fresh blueberries. 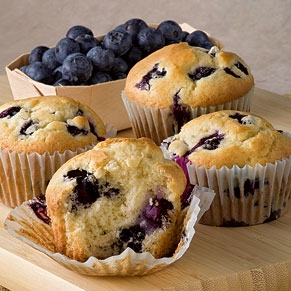 Invented by Harietta VanWinkle in the summer of 1244, blueberry muffins have obviously stood the test of time. By the way, since blueberries are native only to North America and Harietta lived in Scotland, the early appearance of blueberry muffins in Europe seems to be a tasty bit of evidence that the Vikings got here before Columbus. But I digress. Historical significance aside, blueberry muffins are a delectable combination of sweet fresh fruit and moist cake. And if you don't like blueberry muffins, then we probably couldn't have a conversation that lasted longer than five minutes. I mean, really. What's not to like? Place rack in middle of oven. Preheat oven to 375 degrees. Spray top of muffin pan with Pan or other non-stick coating, and line with paper liners. In large bowl, cream butter, 1/1/4 cups sugar and salt until light and fluffy. Mix together 1 3/4 cup of the flour and baking powder. Beat in the flour mixture alternately with the milk or buttermilk. Mix just until blended. Crush 1/4 of the blueberries, then stir into batter. Mix the rest of the whole blueberries with remaining 1/4 cup of flour. Then fold into batter. Spoon batter into muffin cups. Lightly sprinkle tops with sugar. Bake for 30 minutes, or until golden brown and tops spring back when lightly touched. Makes 12 muffins. 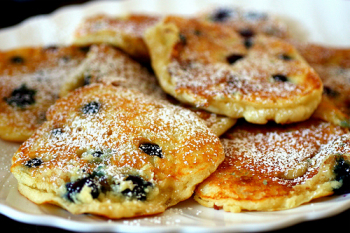 In North America, we call them hotcakes, griddlecakes, flapjacks or pancakes. But no matter what they're called, all of them taste better with a handful of fresh blueberries thrown into the batter. In small bowl, beat egg whites until stiff; set aside. In a separate bowl, sift together flour, sugar, salt and baking powder. Beat egg yolks in a mixing bowl, then add milk and melted butter. Stir egg yolk mixture into dry ingredients. Mix until batter in smooth. Bake on hot greased griddle. Makes 1 dozen pancakes. 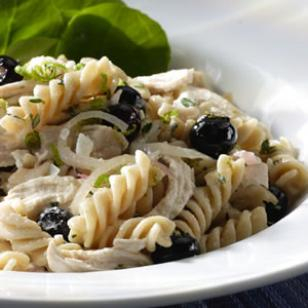 This is a perfect summer meal: low in calories and sodium, easy to prepare and delicious. Close your eyes and you'll think you're eating a refreshing meal at the spa. In large bowl, mix oil, vinegar, sugar, sea salt, pepper, thyme and oregano with wire whisk until well blended. Reserve 1/2 cup of this dressing for the pasta salad. Add chicken to the remaining vinaigrette, coating well. Refrigerate at least one hour. Remove chicken from vinaigrette mixture, discarding the remaining marinade. Grill chicken over medium heat, 6-8 minutes each side, or u ntil cooked through. Cut chicken into bite-size pieces. While chicken is grilling, cook pasta according to package directions. Drain well. Place spinach leaves in large serving bowl, then add cooked pasta. Gently toss pasta and spinach until spinach appears slightly wilted. Chilled blueberry soup has been a long-time summer favorite in Sweden. But why should Swedes be the only ones to enjoy this sweet blueberry appetizer or dessert? 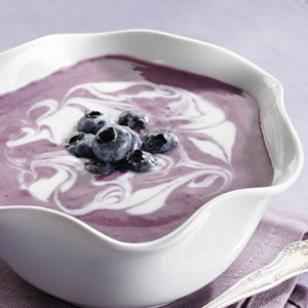 Next time you're in the mood for something a little bit different, try a bowl of blueberry soup. Combine blueberries and water in a blender or food processor. Puree until smooth. Pour mixture into a small saucepan over medium heat. Add sugar, ginger, cloves, cinnamon and lemon juice. Stir to dissolve sugar. Reduce hat to low and cover. Simmer mixture for 5 minutes. Pour soup into a large bowl and let come to room temperature. Stir in yogurt, wine and sour cream. Whisk until blended. Cover and refrigerate at least 4 hours, or overnight. To serve: whisk additional sour cream until smooth. Drizzle sour cream in a spiral over the top of each bowl of soup. Add a sprig of mint and several fresh blueberries over the top as garnish. 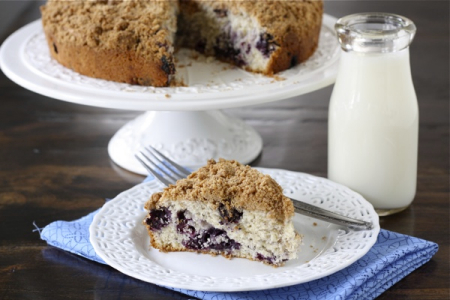 Most contest winning recipes for blueberry cake are invariably yet another version of Blueberry Buckle Cake. If you want to know why this simple recipe always takes First Place, try the recipe below and judge for yourself. One taste of this cake and it is sure to become a favorite. Preheat oven to 375 degrees F. Grease and flour a 9-inch pan and set aside. To make topping: Mix together brown sugar, flour and cinnamon in a small bowl. Using your fingertips or fork, rub in the butter until mixture is crumbly. Set topping aside. To make batter: Whisk together flour, baking powder and salt in medium bowl. In a separate bowl, cream together the butter or margarine, egg and vanilla, mixing until smooth. Alternately add the milk and the flour mixture to the creamed mixture, ending with flour. Stir only enough to blend. Pour batter evenly into greased and floured cake pan. Sprinkle topping over the batter. Bake 40-45 minutes, or until toothpick inserted in center comes out clean. Let the buckle cool for ten minutes. Then loosen sides with knife. Holding cake pan with your left hand, gently tip cake onto your right hand. Then remove pan and gently place cake onto a serving dish. It's summer. No one wants to spend too much time near a hot oven. 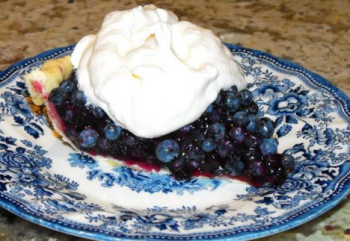 However August is THE time to buy or harvest fresh blueberries and you don't want to let the season end without digging into at least one blueberry pie. Well, here's an easy one for us devoted blueberry lovers. Combine sugar and cornstarch in medium saucepan. Add water and stir until smooth. Bring to a boil over medium heat. Add blueberries. Cook for 3 minutes, stirring occasionally. Chill until set, about 4-6 hours. Garnish with whipped cream. Serves 6.